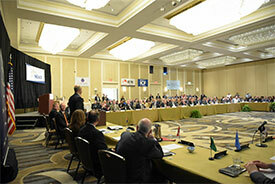 The National Emergency Management Association held its midyear forum in Alexandria, Virginia March 20-24. As a past president, I serve on standing committees to which past presidents are assigned as liaisons (mine are Response and Recovery, Mitigation and Private Sector, and of course, Past Presidents’). With a new administration, these are interesting times. Very capable, but largely un-empowered career personnel were able to provide progress reports within their current, narrow areas of responsibility, but cannot provide a clear sense of the direction for issues like the Emergency Management Performance Grant (EMPG), or the National Earthquake Hazard Reduction Program (NEHRP). Homeland Security grant programs appear to be conceptually safe, but the point of emphasis may change as “border security” becomes more central to the overall mission of DHS. The consensus of my colleagues and of those attending the conference, mostly gleaned in hallway sidebar conversations (and bars, as well) is that Congress is likely to remain supportive of EMPG and other programs it has always supported, despite the ominous tilt of the so-called “skinny” budget floated by the Trump Administration, which hinted at draconian reductions in many worthwhile programs. Most assumed that Congress knows better than to unilaterally accept such a radical redirection of funds that have sustained public safety over the years. We shall see. Bear in mind that while we obsess, rightly, over the future of our programs the big issues that week were the health care debate, the Supreme Court nomination, and of course, the hearings and investigations about Russia’s involvement in our elections and possibly ties to the new Administration. And the twists and turns of those and other issues (such as a series of executive actions that increase the likelihood of environmental catastrophe) make it likely that we will have to strain to get much attention to emergency management issues midst all the political infighting. Here is some good news: Secretary (retired General) Kelly, the new DHS leader, spoke to us. While he made it clear that he knew comparatively little about emergency management issues (refreshingly he did not try to dazzle us), Kelly did effusively affirm his faith in Acting FEMA Administrator Bob Fenton, the career appointee selected to bridge the leadership gap between Craig Fugate and his successor. And FEMA performed well during President Trump’s first series of natural disasters that inevitably seem to afflict new administrations. 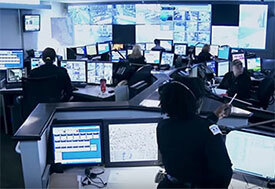 All of this bodes well in the short term for emergency management. The longer term is not necessarily positive; more on that in the future. Finally, as I write this, the FEMA Administrator has not been nominated, although one prominent blogger and a number of colleagues who have recently engaged with Congress are focused on the same name. Secretary Kelly himself said a final vetting was underway. Since I have colleagues who were reputed to be on that list, and they and their families are probably sweating out that final decision, I’ll withhold comment and not speculate further until an announcement is made.